Being frugal may not have always been a popular choice, but it is a choice or a decision many families are making now. Chances are if you have explored personal finance on any kind of level, you have heard about Dave Ramsey. Most certainly if you are not new to our little blog, you have heard us talk about Dave a time or two (or 10). We started our baby step journey before even knowing who he was, but he gave us the focus we needed - and solidified the baby steps we needed to take. If you're going to be successful with your money, you've got to know where it's going. This is more than just glancing over your bank statement at the end of the month. The point is to tell your money where to go at the beginning of the month. The envelope system works because you can actually see your money. You'll know exactly how much you have at any given moment. The envelope system is a system where you place how much money you will spend on categories like groceries, gas, clothing and so on in envelopes. Depending on how often you are paid and how often you pay for these items will determine how often you stock your envelopes. Most of our envelopes are stocked on a monthly basis. Groceries, gas and laundry are stocked on a weekly basis. When we go grocery shopping, we take our envelope. We only spend what is in the envelope. If you go over, I'd recommend putting an item back on the shelf. If that's not an option, the money must come from another envelope - not the debit card, not the credit card. Once the money is gone, it's gone. We each get a blow envelope for the month. Jason can use his blow money on whatever he wants, and I get to spend my blow money on whatever I want. We have not always had a blow envelope; this is actually new as of June of this year. We have found our blow envelopes to be incredibly useful for covering things we didn't think of, like dues for the mama group I belong to at church and printing pictures. This may come as a shock to you, but did you know Christmas falls on the same exact date each year? It blows my mind when people don't budget for Christmas, then Thanksgiving comes around and they're all, "Oh man, we've got to get presents!" Well first, you don't have to do anything. And second, you knew it was coming! We save for Christmas all year and use the money in this envelope to buy three gifts for Bug under the tree, stuff her stocking and stuff each other's stocking. We don't spend a lot and we make gifts for each other, for Bug and for everyone else whenever, however, wherever we can. We use the money here to cover making gifts for Christmas, making things we want to have, and making things to sell. 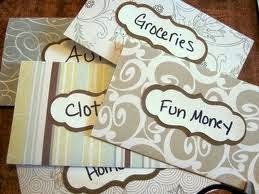 Whenever we do sell crafts, the money we earn goes right back into this envelope. Ideally, this would be a self-sustaining envelope and we wouldn't need to put any money in this per month, but right now it is not. And that's okay. This envelope covers canning supplies for anything we can from our garden plus canning jams. We give jams as gifts for Christmas, to bless other families at our church (and at times, for payment) and to sell. Again, like with the crafting envelope, it would be ideal for this envelope to be self-sustaining. We're not there yet, but we do sell quite a few jars of jam throughout the year. Any money we earn from selling jam goes right back into this envelope. Our gardening costs are a little bit higher than the average person's because we live in an apartment and can only do container gardening. This means we must buy soil each year specifically for use in containers. Regardless of the cost, gardening adds great joy to our lives and is a lesson for Bug. We use the money from this envelope for litter and food. Bug's money goes toward whatever she needs or wants within reason (or whatever we want for her). Most recently, her money was used for swimming lessons. Future purchases include an electric toothbrush and new shoes. Clothing for anyone can come from this envelope. We purchase a lot of our items from thrift stores and garage sales. Most of my clothes are purchased new, and I usually don't buy anything unless I have to. When I found out I was pregnant, we spent money from our savings because I needed more than this envelope would ever have. In a typical season, this envelope is more than enough for our needs. This is such a frivolous envelope, but one that brings such joy to our lives. We are huge Disney fans and we watch our DVDs over and over and over again. They can get really old really fast so we came up with this envelope idea earlier this summer. We put enough money in this envelope to buy one new movie each month. It has been great fun. Garage sales is a really fun envelope to have because so long as there's money in it, you can buy whatever the heck you want at a garage sale. We've bought items like new (still in the package) Disney DVDs, an ironing board, a Sulley doll that roars, a toy truck, clothes, crafting items, etc. I adore living in Michigan, but if I could change one thing, it's that I could garage sale in all seasons. We're not crazy Black Friday (or Thanksgiving) shoppers. We go out around 9 or 10 in the morning and what we shop for is not what we will be sold out - my favorite thing to purchase is new slippers at Kohl's. I'm a wild party animal like that. There are great deals on the DAT, and we like to have some money set aside for the items we need and a few we want (within reason). This is a pretty lenient envelope and can be used for most anything from eating out, to picking apples, to renting a movie. Bronner's Christmas Wonderland is a huge Christmas store in Frankenmuth, Michigan. We've made it a yearly tradition to go, and we set aside a little bit each month so we can buy a few ornaments when we visit. This is the envelope I'm probably most pleased with. It's not going to fund a new car, but we put enough in each month for the routine things we need, like oil changes, new windshield wipers, etc. It won't cover repairs, but that's okay. That's what an emergency fund is for. Okay, confession time: I routinely get my face waxed off. I am seriously one hairy beast - even more so when I'm pregnant and in the post-partum phase. We put enough money in there so I can do this every 6 weeks or so. Whew, that's a lot of envelopes. You don't have to have this many, and you may find yourself needing more. I find it easiest to break everything down to the littlest detail. That's why you'll find a separate envelope for Disney DVDs rather than grouping that money into the entertainment envelope. Based on how many envelopes we stock, you're probably thinking, "Holy cow, how much money do they make?" Ha, not that much; we are a one-income family. I take out $300 a month to stock all the envelopes listed above. Groceries, gas and laundry are funded on a weekly basis and are special envelopes that aren't included in the $300 budget. We have general amounts that we fund each envelope for each month. For instance, Preston generally gets $10 a month. But if one envelope is low and we are in need of money for that category, we will shift things around so that envelope gets more. Just like with groceries, when the money's gone from a specific envelope, it's gone, unless you steal from another envelope. We recently did take money from gardening to fund some extra entertainment. That was a rare occurrence, but if you find yourself shifting money around often, you may want to re-visit the amounts you're putting in each one. Maybe you need to put a little bit more in one envelope and less in another. Envelopes are extremely portable, so when we head out to purchase clothes, we literally take our clothing envelope with us. This allows us to see how much money we have to spend. If you're going garage saling and may be shopping for clothes, you can take both envelopes. If it's clothing you're buying, it can come from either envelope. We've been strict on working the envelope system since June, and it's made a huge difference in what we're able to buy. We are actually buying more now that we're being more strict! It's really freed up our money to be working our budget and sticking to our guns. So long as the money is in the envelope, we're good. If you've use or have used the envelope system before, we'd love to hear how it has or has not worked for you!